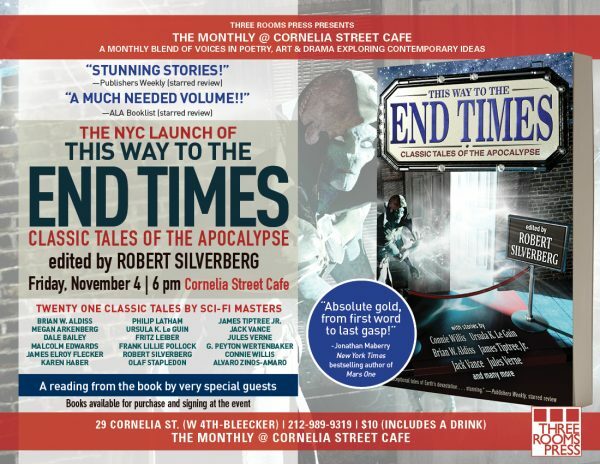 Join us at Three Rooms press for an apocalyptic bash and book reading at the iconic Cornelia Street Café. The event is Friday, November 4th and begins at 6pm. Admission is $10 dollars and includes a free drink. THIS WAY TO THE END TIMES has been hailed as a collection of twenty-one “stunning stories” by Publisher’s Weekly, and includes tales from legendary sci-fi and mystery authors including Jules Verne, Connie Willis, Jack Vance, Brian W. Aldiss, and many more. There will be a reading by very special quests. You never know when the end is coming, and you don’t want to go out without experiencing this book. This is an event you won’t want to miss. This is how we’ll be celebrating between readings of incredible stories. Copies of THIS WAY TO THE END TIMES will be available for purchase at the event.